Rhavas was a good, holy, and pious man-and the cousin of the Avtokrator. He would probably have become ecumenical patriarch of the Empire in the capital, Videssos the city . . . if his world had not suddenly and tragically fallen apart when the Empire of Videssos erupted into civil war and the Khamorth barbarians swarm over the borders. As the home he loved was brutally sacked, Rhavas had to flee for his life, then make his way through lands swarming with fierce nomads and with soldiers loyal both to his cousin and to the rebel usurper. He may never see Videssos the city again, let alone preside in its High Temple. He has always followed Phos, the god of light and goodness, Videssos’ god, and despised evil rival Skotos. Those who fall off the Bridge of the Separator during judgment in the afterlife tumble down to Skotes’ ice forevermore. But when evil seems to have swallowed the whole world, what is a cleric who reveres logic as well as goodness supposed to believe? It’s a harder question than Rhavas wishes it were. If you like historical fantasy with anti-heroes you might be positively surprised by this one and you’ll love it despite its flaws and violence. 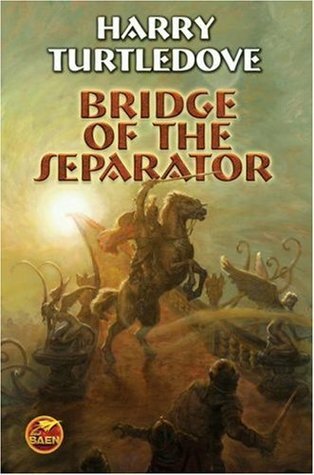 This entry was posted in alternate history, book review, fantasy, religious and tagged bridge of separator, byzantine history and culture, good ideas bad execution, harry turtledove, heresiarch, heresy. Bookmark the permalink. Well, it’s an old fantasy series, small wonder. many fantasies share the same problem tbh. Interesting find you have here.